Whether you ride a street tracker, or a cafe racer, a custom creation, or a stock throwback, the word "Vintage" likely applies to either you or your bike. Luckily, Bell has punched out this category firmly with the Bell Custom 500. This year will be no exception as we welcome three new skins to this exceptional lid. 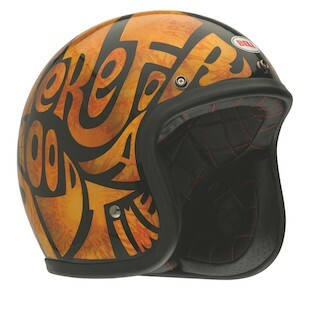 A throw back to the 70s often involves tie-dye and metal flake, which would be at home with the Bell Custom 500 Good Times Helmet. Scripted with the phrase "Here For A Good Time" on one side and "Not Here For a Long Time" on the other in classic 70s font, the design infers a cheery mentality without neon pastel colors. In fact, it should go well with the popular bronze and rust colors found on many vintage bikes. For a sharper look along a similar color pallet, consider the Bell Custom 500 Panel Helmet. 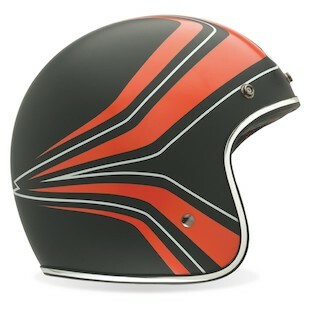 Distinct orange bands with white pin-striping to contrast set this design apart. In addition, the Panel design calls for chrome trim along the ridge opening of the helmet. Though the Panel graphic looks good from any angle, it is best suited while hunched over your bars tracking down the road at speed. 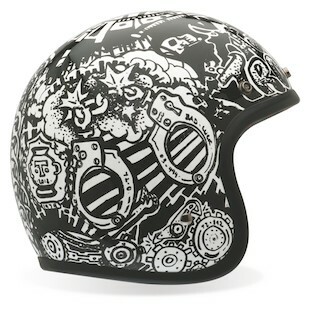 Finally, an exclusive from Roland Sands Design, we cautiously welcome the Bell Custom 500 RSD Trouble Helmet. Presenting a pair of handcuffs as the prime object of attention, this Punk Rock style is complete with gears, skulls, granular grayscale graphics. Completing the look, and perhaps defining the rider, the brim reads "Trouble" in gnarly letters. If either you or your bike is ancient, or if you just have a knack for living in the past, these may be the right pick for you. At an affordable price, it will be hard to resist starting your own private collection with the Bell Custom 500 series.